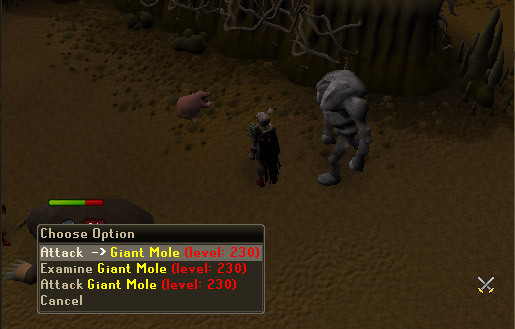 The Giant Mole is a creature found in the Mole Lair beneath Falador Park. The specifics behind the Mole's enormous stature are unknown, but we do know that it involves "a bottle of Malignius-Mortifer's-Super-Ultra-Flora-Growth-Potion" and a once-average-size mole. The Giant Mole is well-known for the loot that it drops when killed. In particular, Mole Claws and Mole Skin may be traded to Wyson the Gardener for Bird's Nests (used in Herblore to make Saradomin Brews), or sold to other players for a hefty price. It also drops verious runes, coins, Dragon weapons, and — rarely — elite Treasure Trail Clue Scrolls. Be forewarned: the Giant Mole is a formidable opponent, with the ability to inflict large amounts of damage. If you're still up for some Giant Mole hunting after reading that, read on for a detailed strategy on killing this ferocious beast! For combating the Giant Mole, it is recommended to use Melee. This guide will only cover the Melee strategy for killing the mole. 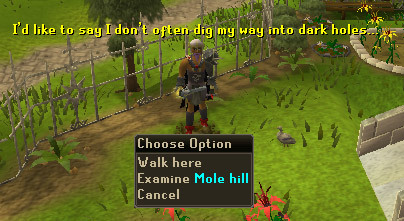 To get to the Giant Mole, you must go to Falador Park and dig, using your spade, on one of the various mole hills. You will then be presented with a warning message, warning of the dangers that the Mole can represent, (this can be toggled off and subsequently toggled back on at the Doomslayer in Lumbridge after enough visits,) press okay to continue into the Lair of the Giant Mole. It is now time to engage the Mole in combat. 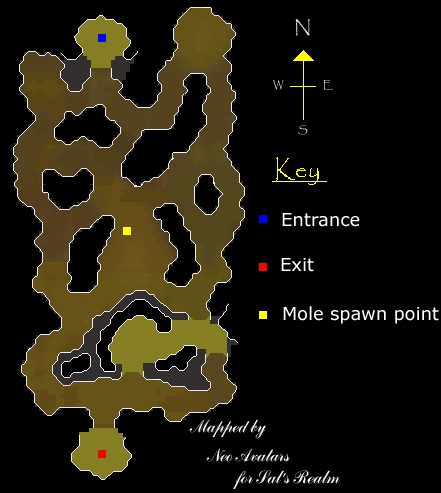 It can usually be found at the spawn point shown in the map (above). At this point you should toggle any prayers you wish to use, (example - Protect/Deflect melee, Piety, Turmoil, Berserker, Soul split etc.) Take a dose of your extreme/super set and click to attack the Mole. Attack the mole with your weapon and special attack weapon, lowering its health. Usually during the fight the mole will burrow into the ground, splattering you with mud and extinguishing any uncovered light sources (this will not happen with the Seers' headband, bulls-eye lantern, sapphire lantern etc.) If this happens simply re-ignite your light source using your tinderbox and continue. After this happens, the mole has re-surfaced somewhere else in the cave, where it surfaces is random. You must now find the mole and re-engage it in combat, where it will potentially burrow away again. The longer the fight lasts the further you will have to chase the mole, this means your run energy will drain faster. If necessary, use the rest feature, drink a dose of energy potion, or use the Terrorbird's Tireless Run special move. 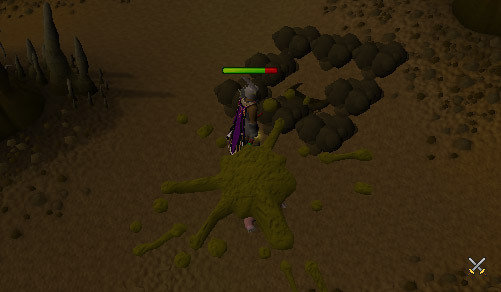 If the mole has been poisoned it will continue to take damage from the poison whilst you hunt it down again. 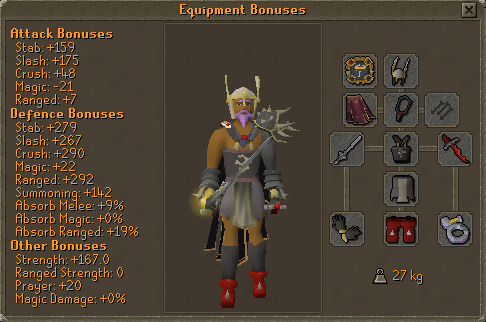 The mole will drop either a Mole Claw or Mole Skin 100% of the time. 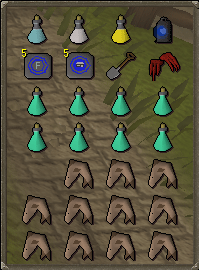 These can be traded to Wyson the gardener in Falador Park for Bird's Nests, which will contain either rings or seeds. With these you can either train Farming or sell the loot. The Nests can be crushed with a Pestle and Mortar. 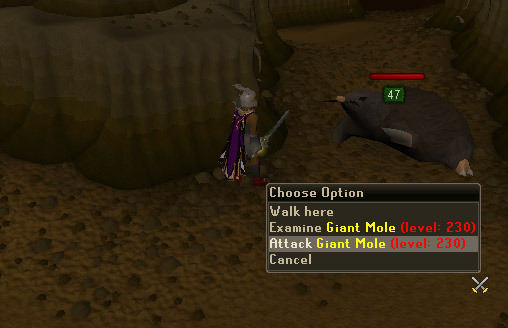 After obtaining the Falador Shield 4 by completing the Elite tasks in the Falador Task System, the Giant Mole has a Mole Nose drop added to it's drop table, which can be traded to Wyson for more valuable Nests. The Falador Shield 4, when worn in Falador Park, also has the "operate" feature which helps players locate the Mole in its Lair below the park. Summoning familiars can be used effectively here, including healing familiars (Bunyip, Unicorn), Beasts of Burden (Bull Ant, Terrorbird, War Tortoise, Pack Yak), or Combat Familiars (eg. Titans). This can work extremely well, as sometimes, when the Mole digs away, your Combat Familiar will give chase, leading you in the direction of the Giant Mole. There is also a safe spot which the mole can be lured into, from here you can range / mage the Mole, or let it simply die slowly after having poisoned the beast by use of a poisonous weapon such as a Dragon Dagger (p++). An alternative to assist with your run energy problems is taking a dip in the Salt Water Pool in Oo'Glog to grant infinite run energy for a limited time. With all of this in mind, you should now be able to efficiently and easily combat the Giant Mole, either alone or as part of a team. Good Luck!